Put oven rack in middle position and preheat oven to 375 °F (190 °C). Peel and halve apples, then core (preferably with a melon-ball cutter). Cut apples into thin slices and toss with lemon juice and 1 tablespoon brown sugar, and 1 teaspoon cinnamon in a bowl. 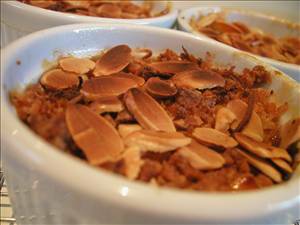 Place apples in baking dish, overlapping slices, and sprinkle with water. Bake until apples are crisp-tender, about 15-20 minutes. Meanwhile, stir together oats, remaining cinnamon, salt, and remaining tablespoon brown sugar in a bowl until combined. Mix applesauce into oat mixture for topping until evenly distributed. Sprinkle topping over apples and bake until topping is golden, 20-25 minutes more. Transfer dishes to a rack to cool at least 10 minutes. 915 members have added this recipe to their cookbook. NO doubt it was delisioussss........it also is full of carbs that would knock me off for a whole dang week........so i must stay clear of things like this as i only do about 25 carbs for the whole day and that is from veggies mostly.. but i bet it was great.. I omitted the pecans and used Splenda Brown Sugar. Loved the outcome! I'm not a baker at all so I did kind of a lazy version. I didn't peel the apples completely but they turned out fine. I didn't have brown sugar & I dislike pecans so I skipped those ingredients. Made it a little healthier. The nutrition info for 1 serving with no brown sugar and no pecans is 92.5 calories, 0.66g total fat, 22.52 carbs, and 1.47g protein (yes I did the math). Oh, and it was delicious! What is the serving size for this meal. Wow! This is really good when you are feeling dessert deprived.I didn't have lemon juice, so I used apple juice instead. Yummy! I think the only thing I would do different is mix the topping with the apples before final cooking. The topping on mine was a little chewy, but once I mixed it up after cooking it absorbed some of the apple juices and it was good. Very Very Good! Satisfy yur sweet tooth while still being good! Do you think this recipe is good for LDLawrence's own diet? There are 165 calories in 1 serving of Apple Oatmeal Crumble. Calorie break-down: 29% fat, 66% carbs, 5% protein. 1 other member has added this recipe to their cookbook for LDLawrence's own diet.